Ahram Online interviewed Joey Ayoub on Sunday, a blogger and activist as well as one of the organisers of the "#YouStink" protest movement in Lebanon. Ahram Online asked him questions about the movement, its goals, its nature and the impact of Saturday's violent clashes between protesters and security forces in Beirut. The ‘You Stink’ movement began as a response to trash being left uncollected in and around Beirut last month when a refuse tip closed, with no agreement being reached by political parties on an alternative. On Saturday, several hundred protesters gathered near the government headquarters in Riad Solh Square and Martyr’s Square, chanting anti-government slogans. At least 35 people were injured on Saturday night after violent clashes between security forces and protesters who are calling for the government to step down after failing to find a solution to the trash crisis. On Sunday, the "You Stink" movement called for peaceful protests at 6 PM Beirut Local time at Riyadh El-Solh square. 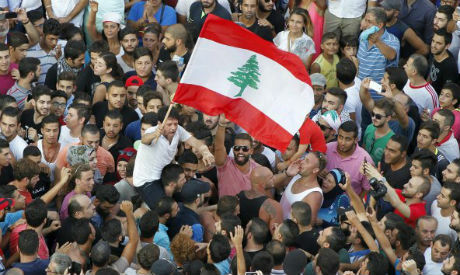 An hour later, violent clashes erupted between the Lebanese security forces and a group of protesters whom the "You Stink" movement considered "Sectarian infiltrators" sent from political groups in Lebanon to spoil the peaceful movement. The movement even released photos and videos showing a group of protesters attacking tents at the Riyadh El-Solh. The movement issued a statement calling on peaceful protesters to move to the Martyrs Square before cancelling off the protest after the eruption of violent clashes between the security forces and what the movement called "other protesters" in the streets of Beirut, condemning all sorts of violence. AO:Did you think that the protests planned on Saturday would escalate violently after the use of violence by the security forces against the protesters? JA: Not at all, we were extremely shocked by what happened. It took us by surprise. We were expecting some water cannons, some basic police brutality but we did not expect the military to be shooting up in the air or to fire tear gas shot in that way at women, children and the elderly- randomly. They did not have a target - they just want to target everyone to cause panic. AO: How can you describe the "You Stink" movement now after the violent escalation on Saturday between security forces and protesters? JA: We basically felt that the government crossed a line we did not expect it to cross. We are still trying to adapt and we are trying to keep things under control so it won't become too violent. Our demands are very simple, very reasonable but we did not expect them [security forces] to act in such a violent way, in a way that they force us to make decisions that we originally intended not to. So I would describe it as very angry, still organised and not out of hand, for now at least. AO: Are there plans for an escalation of the "You Stink" movement? JA: Hopefully there will be no need for escalation; our priority is to keep things under control. There were violent outbursts yesterday after the violent repression of the police and military but we are trying to keep things under control because we want to stay non-violent. Our goals are non-violent, we adopt the philosophy of ''non-violent direct action -NVDA", whether or not that translates to every single person attending our protests -- this is very hard to do -- but we are trying our best. We are not that big as an organising team but we are trying just to keep things under control so people can focus and do not have obstacles like violence. AO: How can you describe "You Stink" as a movement?" Is it a social movement sparked over the garbage problem in Lebanon that turned political or did it aim to bring down the Lebanese government from the start? JA: It is a bit vague because it depends on how you define a political movement. Obviously our goals are political because we have to affect the political class in order to achieve these goals but the people who are pushing for those changes are not political themselves in the Lebanese sense. We are not affiliated with any sectarian party; we do not have any allegiance with anyone. Our only allegiance is to secularism and the Lebanese cause. We are trying to see how to fight for trust and a sustainable society in Lebanon. Calling for social justice in the most basic sense of the word means engaging in politics. AO: When it comes to youth participation, are there representatives from Lebanese youth from different political parties and sects? JA: Yes, of course. We are a secular movement; we do not have any sectarian preferences whatsoever. We do not ask who comes from which region or sect. We are diversified; we have people from all sects in Lebanon including people who do not identify with any sect. Our goal is secular so anyone can join. Ideologically we are only secular and we are not affiliated with any political party officially. We do not have a rule forbidding people officially affiliated politically to participate with us. It is safe to say that we do have representatives from all walks of life in Lebanon and as long as they follow the goals we had set, they are welcome regardless of their class or sect. AO: Did any official from the government or Lebanese political powers try to contact the "You Stink" movement? JA: There have been few political affiliated figures who have tried to contact us directly and indirectly. If I am not mistaken, on Saturday MP Walid Jumblatt tried to speak to us but we refused. We have basically said that if you want to talk to us you have to resign and talk to us because as long as you talk as a member of parliament then you are talking to us as an illegitimate person, as a representative of everything wrong in this country. That would obviously taint our cause. We do not want someone from one political party to come and talk to us because with all the propaganda going on we would be accused of being affiliated with this party against that party and so on - we do not want to have this. Our policy is very clear and simple. We do not have fundamental opposition with anyone- theoretically at least. Those that want to join us are welcome but if they are political leaders or members of parliament then they have to resign. If they resign in an act of good will we can believe that they are on our side. Regardless of what we think about every individual, as long as they are members of the parliament that illegally extended its term twice unconstitutionally and illegally, then they are talking to us as criminals and we do not want to give them a platform. Everyone is talking about Pan-Arab identity and unity. If there is such a thing in this region is how the people feel about their Governments; perhaps this is the only COMMON denominator between Arab Governments; 'They Stink ... They keep their people poor, uneducated, religiously brainwashed, and muzzled, while theses rulers enjoy their cocktails on their mega yachts!